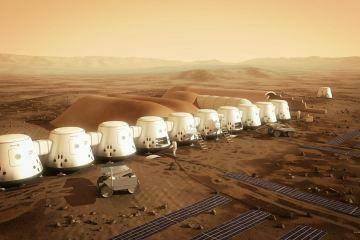 Settlements on Mars are planned to be a permanent habitat for human beings. 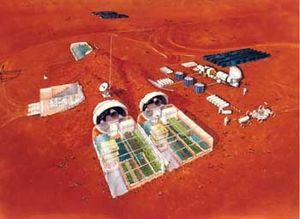 The Mars Foundation™ is developing detailed plans for a Hillside settlement and a Plains settlement. Additionally, a volcanic cave settlement and a multi-layered vault settlement are considered. 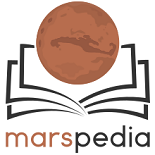 2 Why settlements on Mars? Natural resources should be nearby to avoid long journeys. Natural caves may be used for shelter or for energy storage. Geothermal energy may be used for heating. Protection from solar radiation by mountains versus sunlight for greenhouse lighting. Compared with other celestial bodies, for instance Earth's Moon, the planet Mars provides a number of advantages. The Martian surface and atmosphere consists of all necessary substances that are needed to build and maintain a human settlement, including water, carbon and minerals. The environmental conditions are quite cold, but not too cold. The distance from the sun allows solar panels to operate, which is essential for energy production. Particularly convenient is the existence of a visible sky, which can make people feel at home, and the day-night rhythm is nearly earth like. Though the gravity is lower than on Earth, it still allows people easily to walk and do exercise. The spacial orientation is supported. The comfort of sinking into a pillow for sleeping might be appreciated. And yet, there are several things, settlers would miss. A cold environment is much easier to handle than a hot. Especially on the planetary surface, a settlement on Venus is not possible. Compared with a floating settlement in the Venusian clouds, the Martian surface provides easy access to substances for construction material. This page was last edited on 17 December 2018, at 12:56.